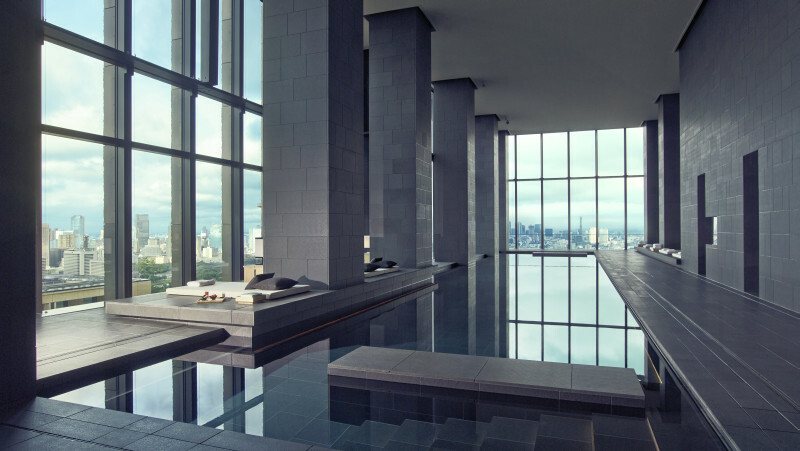 Head to the 34th floor of the Aman hotel in Tokyo, slip into its 30m, basalt-lined infinity pool surrounded by glass walls, and you’ll feel as if you’re swimming through the sky. It hasn’t been left to chance; it’s just another example of the attention to detail that characterises this latest luxury hotel. 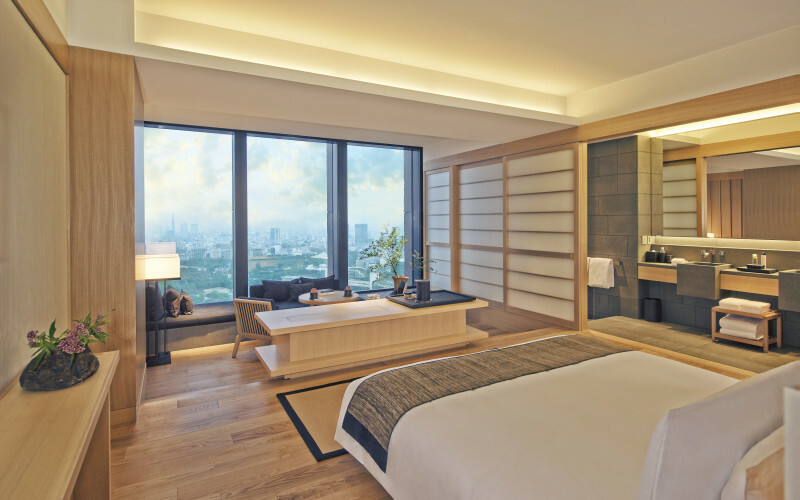 The Aman Tokyo occupies the top six floors of the Otemachi tower in the city’s financial district and is Aman Resorts’ first urban property. The company prides itself on being close to nature and although there are no grounds, it’s still managed to capture a sense of the outdoors in the design. The vast “garden lobby” has rock sculptures and a central pool, with what appears to be a small tree (an example of ikebana – the Japanese art of flower arranging) rising from the water. The ground floor café, Café by Aman, opens onto a small area of woodland, named the Otemachi Forest, featuring 186 trees including oak and ginko, while granite, chestnut and pine are some of the materials used throughout. But it’s the staggeringly high ceilings (the lobby’s 30m high), the wide, light-diffused corridors set with small alcoves (a traditional feature of Japanese residential architecture) and the extensive use of glass which create the most impact. All give a sense of space, and in a country where this is a premium, the Aman seems incredibly indulgent. A friendly, gently-spoken Izumi shows me to my room, taking off her shoes at the door. A day bed sits by an expanse of windows. The Imperial Palace gardens and Mt Fuji frame the view. The narrow bathroom, separated by a lattice screen, is like a mini spa, with a Japanese bucket for bathing, a shower as high as a street lamp and aromatic bags of bath salts and mint to soak in a traditional-style square, basalt bath. It’s a fabulous place to unwind at night, overlooking the lights of Tokyo. Breakfast is an equally leisurely affair with the emphasis on Japanese produce: hiratake mushrooms from the Mie prefecture, yoghurt from Hokkaido and butter from Shimonita, a town 150km north of Tokyo. The chef’s choice of juices (red, orange and green – carrot and ginger, yuzu and mango, and vegetable) set me up for the day, along with a plate of cold meats, an array of fresh fruit, and egg benedict with a tangy hollandaise sauce. At dinner, the sommelier (whose wine list runs to around 1,200 bottles) warns me I might find the choice “overwhelming.” What with set meals, a la carte options, Japanese, Asian, macrobiotic and European-inspired dishes, I’m inclined to agree. In fact, the menu (a bit like a hefty pamphlet) is so big I miss a whole page and lose out on the sashimi starter which I would have plumped for. Instead, I have marinated sea bream from the city’s Tsukiji fish market, blue fin tuna and an exquisite raspberry dessert. While there’s plenty to do o in Tokyo, the hotel also offers a choice experiences for guests. One morning, I meet Masaki, the Aman’s delightful rickshaw guide, who helps me into his sparkling carriage and takes me on a private tour. He pulls the rickshaw, dodges traffic and provides commentary, all without getting out of breath. Later, I wander through the designer stores and antique shops of Omote-Sando, the city’s so-called Champs-Elysees, then head to the Carre Moji gallery where the hotel’s concierge has lined up a treat. I have a private lesson booked with Shimizu Kei, a famous artist, who uses traditional calligraphy techniques in contemporary art. I try to master the basics, but I the spill ink on my fingers and end up smudging my “moon.” But Shimizu is a gracious teacher and offers an encouraging smile. I watch her work quietly and patiently, perfecting curves and flicks with her soft, bamboo brush. When I return to the Aman, I’m told she painted the picture in my room. 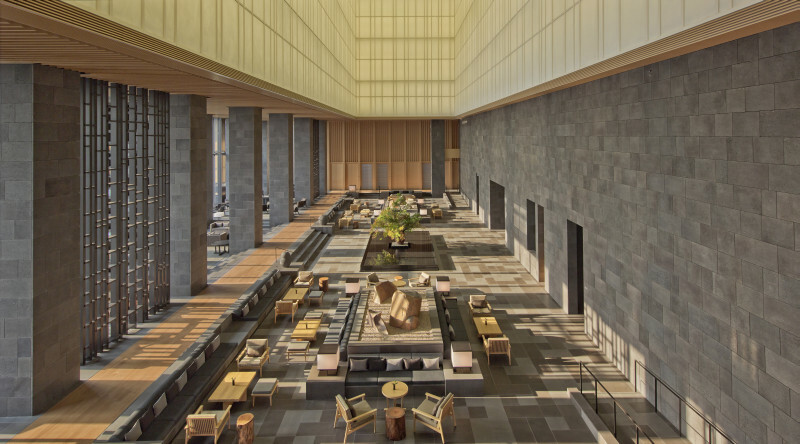 The Aman Tokyo is a luxury hotel occupying the top six floors of the Otemachi Tower in the city’s business district, close to Tokyo station and the Imperial Palace Gardens. All 84 rooms and suites have city views. The hotel has a fitness centre and yoga/pilates studio with Pilates-specific equipment, a 2,500 square metre spa spread over two floors, with eight treatment rooms, a 30m indoor pool, steam rooms and traditional Japanese baths. Rooms from £395 per night, excluding tax and service charge. Sensoji is the oldest temple in Tokyo built in 654 to house a statue of the goddess of mercy which fishermen repeatedly caught in their nets, despite always throwing it back in the river. There’s a massive red lantern at the entrance and a walkway lined with stalls. Waft yourself with incense from the urn in front of the main hall if you have an ailment you’re hoping to cure. Alternatively, buy a fortune for 100 yen. If you’re not happy with it, tie the note to a wire “tree” and leave it behind when you go! Tsukiji Fish Market is the biggest in the world. It’s famous for its tuna auction where a single fish can sell for more than US 10,000. If you want to watch, you need to be there early (around 5am) – even earlier if you want to be sure of a place. Viewing numbers are limited. If don’t fancy setting your alarm, you can still soak up the atmosphere later on. The wholesalers area is worth visiting too. Nihonbashi Mitsukoshi is considered the Harrods of Tokyo. It opened in 1673 as a kimono shop and still sells the bespoke garments from around £10,000. Its food hall is popular and sells a wide range of Japanese and international foodstuffs. Look out for the green tea sponge cakes and the £45 melons from the Miyazaki prefecture, southern Kyushu. Arrive at 10am when it opens, and staff will bow to greet you. The Imperial Palace Gardens is the home of Japan’s emperor. All that remains the original residence is a moat and some walls. The present palace was built in the 1960s. Visits are limited to the East gardens except for two days every year. Shibuya crossing, Shibuya station with its lights and five pedestrian crossings claims to be the busiest in the world. Some say a thousand people dodge each other every time the lights change. You get a good view of the spectacle from upstairs in Shibuya station. Look out too for the statue of hachiko, nearby. The loyal dog used to meet his master, a professor, off the train at Shibuya every day. When the professor died at work in 1925, hachiko continued to wait and did so until his own death, 10 years later. The story’s been turned into a movie. Omote-sando & Carre Moji Art Gallery Wander down Tokyo’s so-called Champs Elysees with its designer shops (Prada, Dior, Louis Vuitton), antique stores and galleries. Visit Carre Moji if you’re interested in calligraphy-style art. There are some beautiful pieces for sale, many very creatively mounted. The Aman Hotel in Tokyo may be able to arrange a lesson with one of the gallery’s calligraphy artists if you’re interested in learning the art’s basic techniques and leaving with a picture of your own! Inside Japan tours Tel: 0117 244 3263 offers small group tours self-guided holidays and bespoke private journeys across Japan. Inside Japan Tours 14 night ‘Best of Japan’ (Classic level) (www.insidejapantours.com/self-guided-japan-holidays/i-bojc/best-of-japan/) covering Tokyo, Hakone national park, Kyoto, Osaka, Takayama and the island of Miyajima off Hiroshima costs from 1980pp. 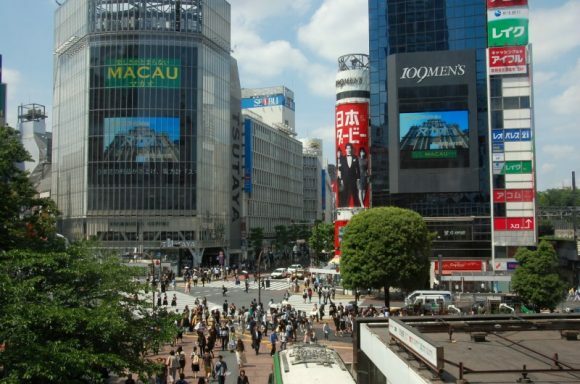 Price includes accommodation, transport (largely by bullet train), meet and greet airport transfers, private guiding in Tokyo and Kyoto, Tokyo and Hakone transport passes, all breakfasts and 5 evening meals. Accommodation is in western style hotels and traditional Japanese Ryokan (guest houses). 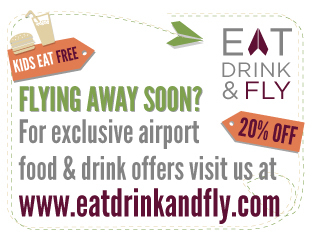 Flights can also be arranged.